Cherry pickers are specialised equipment designed to enable people or materials to reach great height. Because working at height adds an extra element of risk, it is important to use the correct equipment. Doing so ensures that the job is completed safely and efficiently. The following is designed to answer the question of what are cherry pickers? Depending upon the usage for which they were designed, cherry pickers are specialised for different tasks. Some are made to work in small, narrow spaces whilst others are made to work in mud, dirt, and other adverse conditions. Some cherry pickers are made to be road towable whilst most require transit by trailer. To answer the question of what are cherry pickers, it is also helpful to talk about the different mechanisms that raise the platform or bucket. An aerial lift or boom lift has a simple hydraulic arm to lift the apparatus to the height that you need. Because it is horizontal when not in use, the arm length must be equal the length of the vehicle for stability purposes. The articulated boom lift, on the other hand, is solves that problem by its very design. Designed with joints in the arm, an articulated boom lift enables a higher reach while retaining safety as well as stability. If you need a cherry picker with both horizontal reach and vertical reach, a self propelled boom could be the answer. A self propelled boom allows movement with the platform raised. In addition, it is ideal for work that involves getting under structures, such as bridges, or under places such as overhangs. When deciding whether to hire a cherry picker or to purchase one outright, it is important to note a few factors. If you will have the need for a cherry picker for just a short term or one time job, a cherry picker hire would probably suit your needs. If, on the other hand, you will need a cherry picker for a longer term job or if your business will be in the practice of needing to work at height, purchasing either a new or used cherry picker is probably the better business decision. The search to find a company that offers either cherry picker hire, or that sells new or used cherry pickers is best begun on the internet. 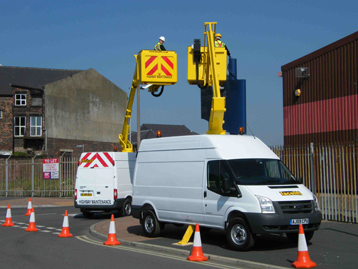 By entering the words "cherry picker hire" or "purchase new or used cherry picker UK" will bring up companies that offer such services in, or close to your area. Most companies have an online quotation form in which you can provide your information. Providing this information will enable to company to suggest cherry pickers that are right for the task you are planning. In addition, this information can also be used to obtain a quote that outlines all the conditions and costs associated with the cost of a cherry picker hire or the purchase of a new or used cherry picker. By researching what are cherry pickers as well as the different types and options available, you will be able to make the right decision regarding a cherry pickers service.